La Fondation Frantz Fanon s’associe à la pétition demandant le départ de Warren Kanters, vice président du Musée Whitney de New York. Warren Kanders a fait toute sa carrière en tant que président du groupe Safariland LLC – plus grand fabricant d’armes anti émeutes et de munitions chimiques mais aussi de combinaisons de protection et de gilets pare balles. Certaines des armes qu’il fabrique sont utilisées aussi bien contre des migrants à la frontière Mexique/US, contre des manifestants en Turquie, à Bahreïn, au Koweit ou à Ferguson, contre les Palestiniens dans les territoires illégalement occupés, contre les prisonniers détenus aux Etats Unis… 100 membres du personnel du Musée sont à l’origine d’une pétition, ils jugent incompatible le mandat de Warren Kanters à la vice présidence du Musée avec l’idéologie qu’il développe pour justifier son business. « Se taire c’est être complice », ils refusent de l’être. Signez la pétition en envoyant un email à kandersletter@gmail.com. Elle fait partie des nombreuses actions envisagées au Musée Whitney par différents groupes dans les 8 semaines à venir. Pour plus d’informations, suivre ce lien. We, the undersigned theorists, critics, and scholars, are writing to address the unfolding crisis at the Whitney Museum, and to call for the removal of Warren B. Kanders, the vice-chairman of the museum’s board. In making this call, we are amplifying a demand put forth by 100 members of the Whitney staff in a letter to the museum administration in November, 2018. Kanders is the CEO of Safariland, a « law enforcement products company » responsible for the manufacturing and marketing of weapons such as the tear gas used against migrant families at the U.S./Mexico border, Water Protectors at Standing Rock, protestors in Ferguson, Oakland, Palestine, Puerto Rico, Egypt, and more. Safariland also supplies the NYPD and Corrections Departments across the country.We stand with those members of the staff who organized and spoke out at great risk to themselves, and the dozens of grassroots groups that have been taking action at the Whitney Museum in the period since the staff letter was released. The demand to remove Kanders points to broader patterns of toxic philanthropy on museum boards, universities, and other public and private institutions. Protests are currently proliferating around museums, from P.A.I.N. Sackler’s recent success in forcing the Guggenheim and the Tate to cut ties with the Sackler family,to ongoing campaigns targeting El Museo Del Barrio, MoMA, the American Museum of Natural History, the Brooklyn Museum, and the Brown University Arts Initiative where Kanders is also a donor and board member. These calls to hold institutions accountable, and to deeply transform them, have a long historical lineage, including the work of the Black Emergency Cultural Coalition and the Art Workers Coalition in New York City during the 1960s. The Whitney and institutions like it are sites of struggle, bringing multiple stakeholders together in acts of solidarity. These new formations, in turn, flow into broader movements for freedom and justice. 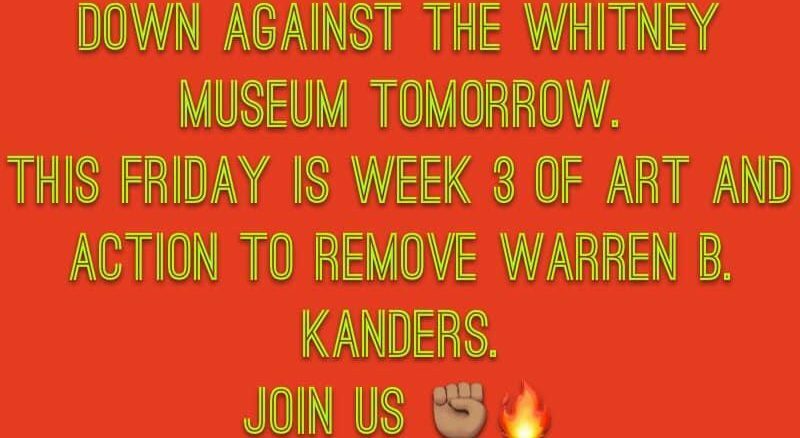 The demand to remove Kanders issued in the staff letter, and the subsequent mobilization by dozens of community groups for the ongoing 9 weeks of art and action, suggest that the tides are turning. Saying “no” to Kanders opens a positive opportunity to begina deep, and long-overdue conversation about artwashing, the role of private funding in the cultural sphere, and the accountability of institutions to the communities they claim to serve. The Whitney staff letter has called for « the development and distribution of a clear policy around Trustee participation, » that would “clarify what qualifies or disqualifies a wealthy philanthropic individual for the Board. Is there a moral line?” Clarifying lines of unacceptability concerning Trustee participation is a crucial step by the museum, but on its own this reform will not resolve the crisis at the Whitney, or at other institutions facing similardilemmas. At stake are deeper structural questions related to the distribution of power and the shape of institutional governance. These questions have been addressed in recent years by a range of grassroots groups and student movements working to “decolonize” museums and universities. They are building solidarity across struggles by demanding decolonization commissions that include community stakeholders, and that are guided by a variety of urgent principles: Indigenous land rights and restitution, reparations for enslavement and its legacies, the dismantling of patriarchy, workplace democracy, de-gentrification, climate justice, and sanctuary from border regimes and state violence more generally.